« The Universe is (Mostly) Flat! Circular and elliptical orbits of the "same size": the average between the planet and the host star is the same in both orbits, so they take the same amount of time to orbit. However, at the farthest point in the elliptical orbit (the apastron), the planet is significantly farther from the star than at its closest approach (the periastron). The figure above shows two orbits of the same “size”, but different eccentricities. The “size” of an orbit is the average distance between the planet and its host star, and that alone determines the length of the planet’s year—so a planet in either of these orbits would take exactly the same amount of time to travel around its sun. 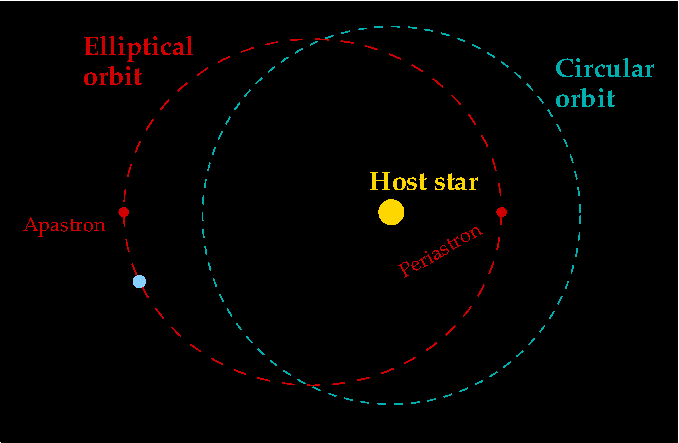 However, if an orbit is eccentric enough, it might freeze at its farthest point from the star (its apastron), or it might boil at at its closest approach (the periastron)…or both. For Kepler-22b, we know the size of the orbit but not its eccentricity. 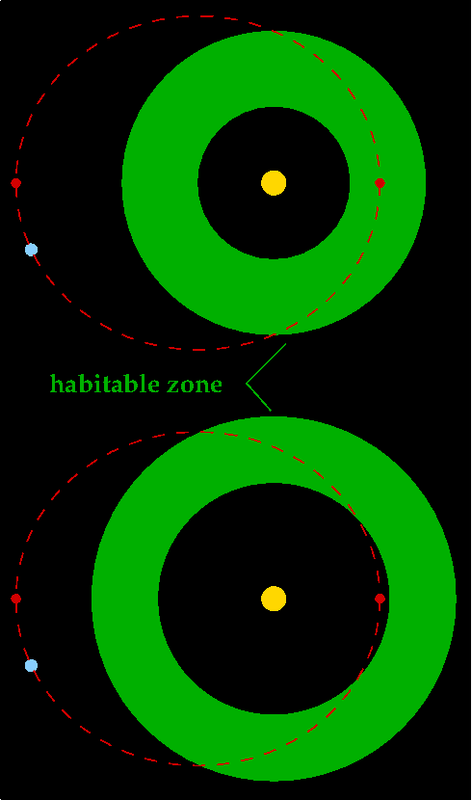 Two possible complications for habitable zones and elliptical orbits. In the top picture, the planet is in the habitable zone for its periastron but not its apastron, while in the second case it passes through the habitable zone, but is too hot at periastron and too cold at apastron. The Kepler mission is capable of measuring the period of orbit (the exoplanet’s year) and the diameter of the planet; to find its mass is somewhat more complicated. Since Kepler-22b is relatively far from its host star and (based on its size alone) much less massive than Jupiter, it won’t exert enough of a tug on the star to give it a big wobble. That’s why current exoplanet catalogs are dominated by large-mass planets orbiting close to their stars: they’re simply easier to detect. Kepler-22b cannot be greater than 35 times more massive than Earth, since that would be detectable by other means. However, that figure means we don’t actually know the mass of Kepler-22b at all. 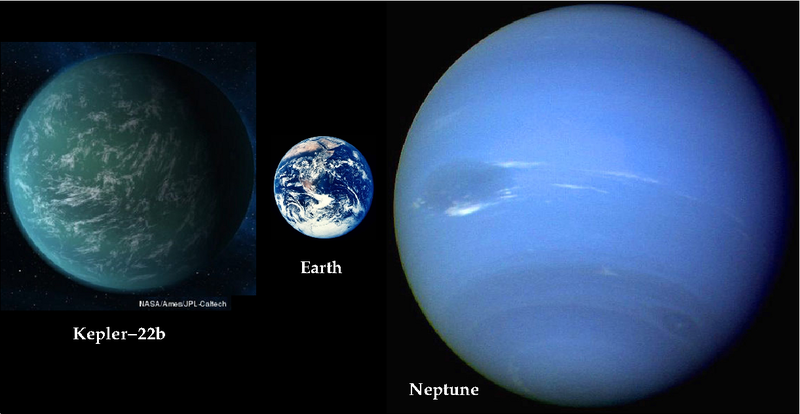 The estimated size of exoplanet Kepler-22b (in an artist's depiction) compared with Earth and Neptune. If it has the mass at the high end of the scale, the planet is roughly 2.5 times more dense than Earth. I have no idea what that means in terms of composition, but it doesn’t correspond to anything in our Solar System. If its density is equal to Earth, then its mass is roughly 14 times Earth’s mass; if its density is the same as Neptune’s (a more likely option, in my opinion), then it is about 4 times Earth’s mass. In other words, there’s a big range of possibilities, based on whether the planet is more rocky or fluid in composition. Update: Caleb Scharf pokes holes in my naivete, and argues that a higher density and mass are more likely than my initial guesses. To complicate matters further, we can’t work backwards from the size alone: while rocky planets are more dense than gaseous planets on average, the most dense planet (with the euphonious name PSR J1719-1438 b) is 4 times the density of Earth, but may be the core of a dead star—and hence technically gaseous. So we really need an independent mass measurement before we can conclude anything about the composition of Kepler-22b, which again determines if the planet is solid or not. However, after thinking about all the complications, there’s too many factors involved to say for certain. I can imagine many scenarios that would allow liquid water to exist on Kepler-22b, even if its orbit is too eccentric for the habitable zone and hence freezes over. After all, a lot of water freezes on Earth, and if Europa and Enceladus are habitable, that stretches our range of possible conditions anyway. A planet with high greenhouse-gas concentrations or big oceans will freeze a lot less readily, whatever its orbit looks like. So let me be someone positive here: Kepler-22b is not Earthlike, but it’s so interesting to consider its possibilities. Let’s be realistic in our assessments, but indulge our hopeful imaginations a little bit too. Mars is dry today, but the evidence continues to mount about its wet past. We have a comparatively big Moon that has shaped our planet’s history. Life itself (in the form of cyanobacteria) produced the oxygen in our atmosphere that is necessary for human life. When the rest of the data on Kepler-22b comes in, we are likely to be surprised in some way. That’s part of what makes science a joyful endeavor. Great post. I was wondering how the Kepler team estimates that the eccentricity is zero (see their table, http://kepler.nasa.gov/Mission/discoveries/). Also, I was thinking that if Kepler-22b is too large to support life, perhaps it might have a large, habitable moon. Looking over the paper (http://arxiv.org/abs/1112.1640), I think they left eccentricity as a free parameter and fit it along with other orbital parameters. However, they don’t actually report a best-fit eccentricity in their published data table, so I’m still puzzled. In the data table on the site, they say , but no explanation what the braces mean. Does that mean assuming 0, this is what the other parameters are? I feel like asking about it. Let me know if you do and you get an answer! Their table needs more explanation. This question about its eccentricity also has me puzzled. I’ve seen in some literature that transit methods are more likely to find eccentric as opposed to circular orbiting planets. Also, that eccentric are more common than circular orbits for planets. Finally, that transit methods do not determine the difference. All this seems to point to a likelihood that the eccentricity of Keppler 22b’s orbit is unknown but significant in regards to its inhabitability.